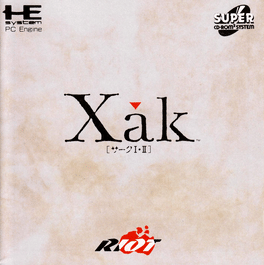 Xak I & II is a re-release of Xak and Xak II, a fantasy role-playing video game series Xak developed and published by the Japanese software developer MicroCabin and Telenet Japan's development team Riot. This set contains both the first two Xak series games back-to-back on one complete Super Cd-Rom^2 with enhanced graphics and sound. In a similar style to Ys Books I & II, also for the PC-Engine system, Xak II, the second game in the series picks up immediately as the first game concludes.